Team spirit despite the rain – what a game! Sunny Tampa — definitely not a bad way to ring in the New Year! Unfortunately, the 70-degree weather on New Year’s Eve faded away with 2009. On Game Day, we were up and at ‘em, out the door early and ill-prepared for the rain and wind and cold that lasted all. day. long. Luckily, the bad weather didn’t break our spirits. 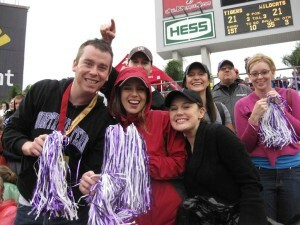 Here’s a group shot of us showing our Wildcat pride, just after Northwestern tied it up in the third quarter. Happy 2010!